Journey was released approximately one year ago and, to celebrate the occasion, I joined some folks in replaying the game last weekend. Seeing people min/maxing Journey weird. Even a year after its release, I managed to come across numerous companions on my adventure. A few of these people had clearly played the game before, as they quickly found the hidden runes and obscure murals in each level. One person in particular would dash through the levels as fast as possible, collecting the runes and opening the gates to the next area as if she/he were being chased. 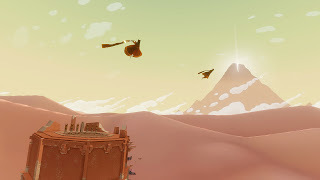 It strikes me that I didn't see such behavior when I played Journey for the first few times last year, as people were still strangers to the desert. It actually made for a somewhat stressful dynamic, as I was much more apt to wander around the levels while my partner was all business. The drop-in, drop-out multiplayer is extremely elegant. Without any obvious loading, server messages, or invites, meeting and subsequently parting with people feels organic. It also rewards you for paying attention to your companion, since you can only tell the difference between partners via visual and behavioral cues. I hope future, passively-online games like Bungie's upcoming Destiny are taking note. The music is (still) amazing. The various recurring motifs and themes are almost like another character. I made a point to pay close attention to the way the music cues and loops, as it always seems to reach a crescendo right when something dramatic is happening. The more I listen, the more I start to view it the music as akin to level design, it has a huge impact on framing the in-game world and the overall experience. Journey is a triumph of restraint. It's hard to find any extraneous material in the game. Besides the initial onscreen prompts that teach you movement basics, all communication with the player happens without menus, voice overs, or tutorials. There aren't any wacky side quests or score chases. Every moment of the game feels meticulously refined. I dilly-dallied and still completed my journey in under two hours. Even so, the narrative ride offers a better sense of discovery, hardship, and eventual triumph than most 50-hour open world games I've played. You can tell a story about a difficult quest without any grinding. The sand surfing through the ruined city and the final ascent to the mountain are some of the best moments in video games. Not much else to say here except that I imagine they will continue to be stand out moments far many years to come. If anyone else revisited Journey last week, I'd be interested to hear your impressions. And if you missed it, don't worry: I'm planning on making one more run this weekend. If come across a traveller in a white robe, it just might be me! Copying and pasting this after commenting on your piece too, but I found the whole experience entirely unique from my first encounters with the game as well. Every person I met along the way was white-robed. Each person went about their business for the most part, except for the last person I joined, who stuck by me the entire time. I think I would describe this playthrough as a ceremony. The person I was with at the end, presumably, loved this game as much as I did. It was like we were both revisiting the game and honoring it, and having a partner for that experience felt amazing. Almost like a pilgrimage. I'll certainly keep playing yearly until the servers are turned off. Then I'll at least play one more time, to make that pilgrimage alone. Wow. So Journey just provided Katie and me the most heart-warming video game moment I have maybe ever had. We just jumped on the Journey train this past weekend and have played through about 3 times now, and this final time has been spectacular. We got about halfway through the game and met up with a white-robed person who was clearly expert at the game and, like two lovers meeting eyes across a crowded room, we had some chemistry. We quickly jumped into sync flying, hardly touching the ground through much of the rest of the game until the snow levels. This player really showed us the ropes. Secret rooms, hidden glyphs we hadn't found yet. It was magical. But the real triumph came at the end of the game. When you finally reawaken and fly through the final happy zone and reach the mountain top there is a small area with a patch of snow you can walk around right before you finish the game. Our white-robed companion took it upon themselves to draw a heart in the snow and chirp their love many many times before we walked into the light together. That unprompted expression of joy in the only way the game could was spectacular. I really liked Journey when we played it our first go through. I really love this game now. When we are so used to being shot in the face by nameless dudes and wracking up kill counts with AK47s, it was an absolute pleasure to just have someone be kind in the online sphere and show genuine appreciation for just having a good time. When I went back, I had someone make a heart too! I had never seen that before and, even after playing the game many times, it was still absolutely stunning. So glad you still enjoyed it!